This gallery of equipment images is designed to help you identify common types of equipment for placing pavement and the base material that supports it. Roto-Mill: c. 1992 Cat PM565. 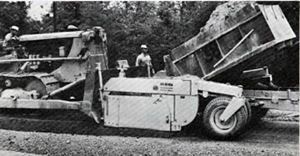 Also called a cold plane, profiler or milling machine, the Roto-Mill pulverizes and removes old asphalt pavement for recycling or disposal during resurfacing operations. Spreader box: 1960s Ulrich 18A. The spreader box is pushed by a dozer and has no bottom. A dump truck fills it with base material, which falls to the roadbed and is spread by the back of the box. Base paver: 1950s Blaw-Knox. 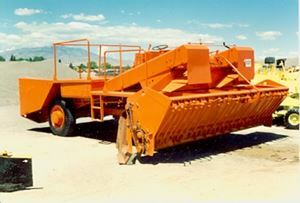 In the 1950s and 60s, spreader boxes could be permanently mounted on a crawler chassis, but the idea of using them as detachable attachments on crawler tractors prevailed. Trimmer: c. 1976 CMI TR225. Before any pavement can be laid, the subgrade must be precisely graded. Using roadside stringlines for reference, the trimmer removes excess material to the shoulder. Road Widener: c. 1968 Blaw-Knox RW195. 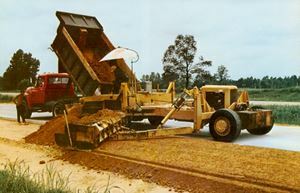 Also called a shoulder spreader, this machine receives material from a dump truck and spreads it to the road’s shoulder. 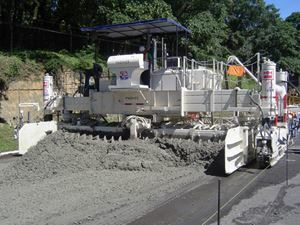 Stabilizer: Many roadbeds are stabilized with lime or cement before paving can begin. Resembling a giant roto-tiller, a stabilizer pulverizes the top few inches and mixes it with water and additives. 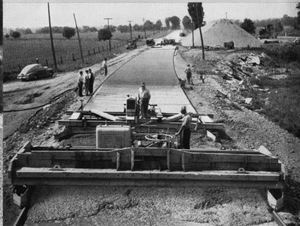 Dry Batch Paver: From the 1910s until 1960s, concrete was mixed and placed on the roadbed by a paver. Dry materials were delivered to the skip in back, and concrete was placed by the traveling bucket. 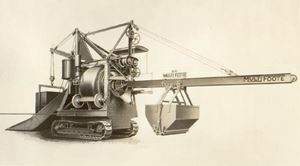 Form-riding Concrete Paving: Machines that rode on the forms that shaped the slab’s sides leveled, tamped and finished the concrete to final profile. After the concrete cured, the forms were removed. Slipform Paver: c. 2007 Terex SF3502. This machine makes steel forms to shape the slab obsolete. The slab is shaped by a form that moves with the paver, and concrete is mixed offsite and trucked in. Slipform Paver: c. 1997 Gomaco Commander III. Some slipform pavers can be set up to place and shape narrow lanes, sidewalks, curbs and specialized structures such as median barriers. 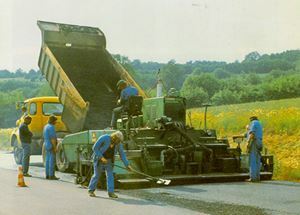 Asphalt Distributor: c. 1970 Etnyre BTHL on Ford C700 truck. 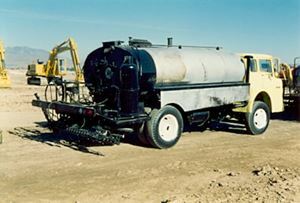 This vehicle sprays hot liquid asphalt on the roadbed prior to asphalt paving or chip surfacing. Chip Spreader: 1965 Flaherty K. A chip spreader places a thin sheet of chipped gravel on the asphalt sprayed by the distributor. This type of surfacing is used on many lightly traveled roads. 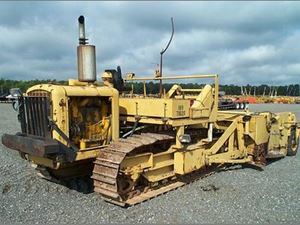 Asphalt paver: Barber-Greene SA41. 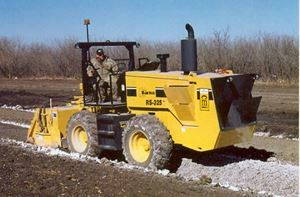 Traveling on crawlers or tires, this machine places asphalt concrete pavement. 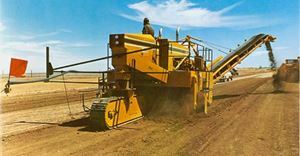 A conveyor carries the mix from the front hopper to the rear screed that spreads it. 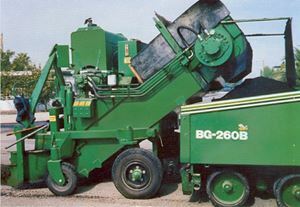 Windrow Elevator: c. 1988 Barber-Greene BG610H. Asphalt concrete may be delivered to the paver by trailers that dump it in a windrow. This machine scoops up the mix and places it in the paver. 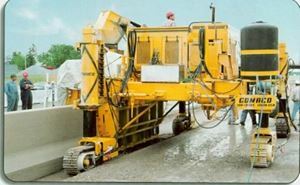 Asphalt Transfer Machine: Roadtec LTV1000. Asphalt concrete may start solidifying during delivery. This machine receives it from the truck, re-mixes it and places it in the paver’s receiving hopper.